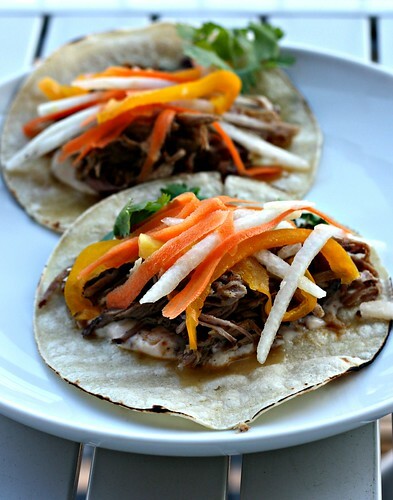 Slowcooker Cuban Pork – Elly Says Opa! I’ve come to realize that I should probably rename my crockpot the “shredded meat maker.” If there is one thing I always feel comfortable cooking in there, and that always turns out well no matter how long I’m gone, it’s shredded meat of some sort, be it for tacos, sandwiches, or Asian dishes. When I first saw this recipe, I immediately knew it was going to get the crockpot treatment. I really liked the sound of the pork – nice and citrusy with just a small touch of heat (and a little more if you choose to make the chipotle cream). Plus, I love a nice crunchy counterpart to a crockpot meal, which is obviously not going to have a whole lot of texture. Between the crunchy slaw and citrus flavors in this pork, this is a nice, bright meal, which is not always easy to achieve in a slowcooker. Plus, the meat is pretty versatile. The first night, we had the pork in a similar way to the original blogger – as tacos, with a crunchy slaw. 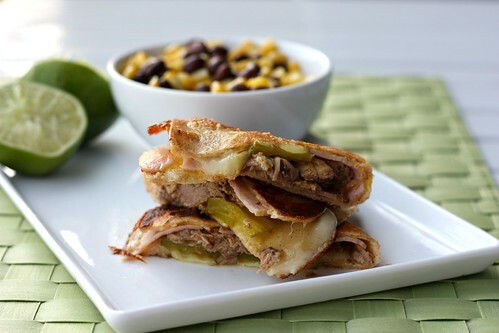 I froze some of the leftovers and we had the pork a couple weeks later in Cuban quesadilla form – all the ingredients in a Cuban sandwich (yellow mustard, pork, ham, pickles, Swiss cheese) but in a tortilla instead of a roll. I’m not sure which I liked more! Update: This is great in these Caribbean bowls in place of the chicken. Make a paste by combining the first 11 ingredients (through pepper). Rub the mixture all over the pork roast. Cover and refrigerate overnight. Heat a large, heavy-bottomed skillet over medium high heat and add a small amount of oil. Place the roast in the skillet and brown on all sides. Place in slow cooker. To the skillet, add the onion, garlic, and jalapeno and saute for a coupe minutes until soft. Add to slow cooker. Combine the orange/pineapple juice, orange zest, lime juice, chicken/beef broth, and Worcestershire. Pour over and around the pork and onion mixture. Cover and cook on low for 8 hours. Shred with a fork and serve on tacos. Note: If there seems to be a bit too much liquid, remove the lid from the crockpot and turn to high. Continue cooking while you make the rest of your dinner, and until the juices thicken a bit and are absorbed. Toss together all ingredients in a medium bowl. Mix all ingredients in a bowl or mini food processor until well combined. Note: This recipe has been modified since it was originally posted. I added jalapeno and Worcestershire, removed the honey, and have modified some of the directions.